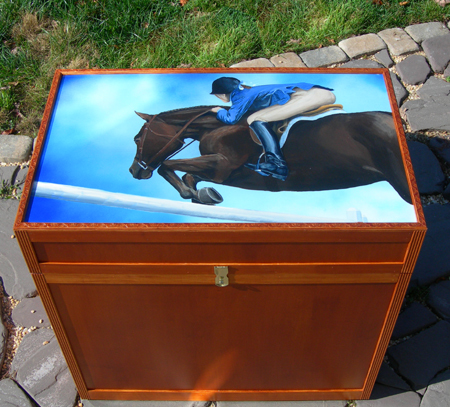 Beautifully excecuted works bring your horse to life in full color. Portraits start at 8" x 10" finished from your photo meticulously rendered in guache and watercolor on extremely high quality Italian 300lb hot press paper. I also offer the unique option to have your portrait painted on a surface that I create and seal so your work can be framed like an oil. The process adds about a week to the time of the painting, but the sealing process adds even more vibrancy to the colors. Four Easy Steps to Start the process! 1. Decide on a photo. 4. Receive your painting! It's that simple!!! Adding another subject to your finished piece is easy. If it is another horse, just send another photo and I can place both horses in the same painting. If you have a photo with a person in it, I can paint human portraits too. I paint larger paintings -- up to 30" x 42" on paper and solid surface, all in watercolor/guache. This is my preferred medium because I can capture the details and luminosity of the horse's eye and velvety texture of the horse's coat. To attach to a trunk or box, I use a giclee (fine art quality print) of the piece, and use my sealing technique to attach the giclee to the box. You can order a fine giclee print of your portrait, or of select paintings from my website. Giclee prints start at $100 for an 8" x 10". 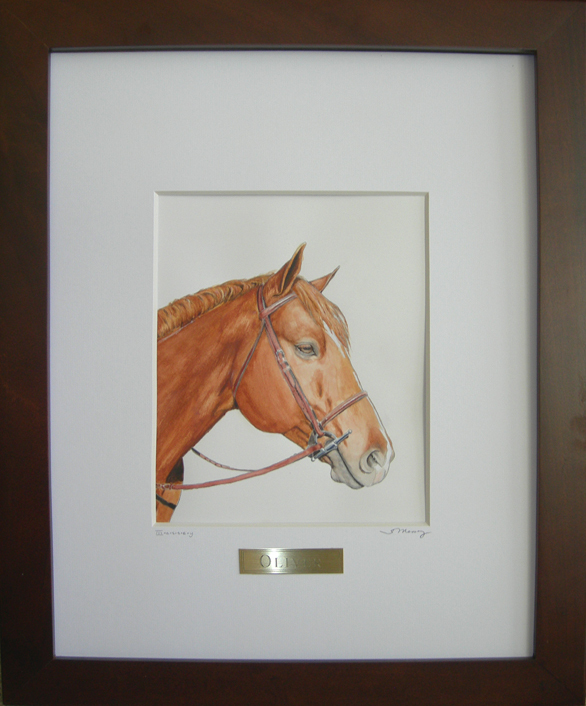 I can also have your horse portrait printed on cards, letterhead or note paper and use transfer methods to print on t-shirts, bags and silk scarves. Contact me for pricing and ideas! I respect artists' and photographers' copyrights. In sending photographs, customers guarantee that they have full rights to copy or duplicate those photographs in any manner. I request permission to publish the photograph on my website, and will assume this permission is granted unless otherwise notified by the customer. I reserve all copyrights during the life of my paintings including the right to publish them online or in print at any time. My paintings cannot be duplicated or published, in part or full, in print or electronically, for personal or public use without my express and written permission. If you see a strange shadow on the paintings shown here on this site, its the 'watermark' added via computer to show copyright. It's definitely not part of the painting! Completing a basic 8" x 10" portrait takes 4 to 6 weeks, depending on my workload. Larger or more complex paintings or paintings with multiple subjects will take longer. I carefully pack the painting and box it securely for shipping and can ship USPS or UPS. Shipping costs depend on size and weight of painting as well as delivery mode and shipping zone. Larger paintings may incur extra shipping charges. See my hints page for photos for ideas about how to take the best picture. I recommend high definition digital photos attached in an email as the easiest method. If you have a quality printer/scanner, then you can scan your photo at 300 dps, save the file and then attach it to an email to me. If you need to send a printed photograph, email me for shipping directions. When sending photos via email, send as many as you want, but you should attach only one at a time with your email. Emails with several large attachments tend to gum up in the system and don't move. Just write your name in the email, and the name of the horse, attach one photo and click send. In the subject line write which photo you have sent out of the total, e.g) 'one of three' etc. If you want a plaque for your painting, Cedar Ridge Engraving in Virginia offers a 3/4" x 2 7/8" solid brass plaque without holes. Ask for the 'tape' on the back to attach it to your frame or matting. They offer several different type faces to choose from for the engraving as shown below. Visit their website for more information. "Lori captures the essence of each horse so completely that even people who don't know the horse can plainly see the soul and personality showing through. For the people who do know the horse she's painted, it's drop dead stunning. You feel like you're waiting for the horse to blink. She's that good!" "Words cannot describe how amazed I am!"